Not to be confused with England men's national rugby league team. This article is about the men's team. For the women's team, see England women's national rugby union team. The England national rugby union team competes in the annual Six Nations Championship with France, Ireland, Scotland, Italy, and Wales. They have won this championship on a total of 28 occasions (with the addition of 10 shared victories), 13 times winning the Grand Slam and 25 times winning the Triple Crown, making them the most successful outright winners in the tournament's history. They are ranked fourth in the world by the International Rugby Board as of 18 March 2019. England are to date the only team from the northern hemisphere to win the Rugby World Cup, when they won the tournament back in 2003. They were also runners-up in 1991 and 2007. The history of the team extends back to 1871 when the English rugby team played their first official Test match, losing to Scotland by one try. England dominated the early Home Nations Championship (now the Six Nations) which started in 1883. Following the schism of rugby football in 1895 into union and league, England did not win the Championship again until 1910. England first played against New Zealand in 1905, South Africa in 1906, and Australia in 1909. England was one of the teams invited to take part in the inaugural Rugby World Cup in 1987 and went on to appear in the final in the second tournament in 1991, losing 12–6 to Australia. Following their 2003 Six Nations Championship Grand Slam, they went on to win the 2003 Rugby World Cup – defeating Australia 20–17 in extra time. They again contested the final in 2007, losing 15–6 to South Africa. The year 1909 saw the opening of Twickenham as the RFU's new home, which heralded a golden era for English rugby union. England's first international at Twickenham was in 1910 and brought them victory over Wales, and England went on to win the International Championship (then known as the Five Nations) for the first time since the great schism of 1895. Although England did not retain the title in 1911, they did share it in 1912. A Five Nations Grand Slam was then achieved in 1913 and 1914 as well as in 1921 following the First World War. England subsequently won the Grand Slam in 1924 and as well as in 1925. This was despite having started 1925 with a loss to the All Black Invincibles in front of 60,000 fans at Twickenham. In 1997, Clive Woodward became England's coach. That year, England drew with New Zealand at Twickenham after being heavily defeated in Manchester the week before. England toured Australia, New Zealand and South Africa in 1998. Many of the England team made themselves unavailable for the tour nicknamed the "tour from hell" where England were beaten 76–0 by the Wallabies. In 1999 during the last ever Five Nations match, Scott Gibbs sliced through six English tackles to score in the last minute, and with the ensuing conversion by Neil Jenkins, handed the last ever Five Nations title to Scotland. England commenced the new decade by losing the inaugural Six Nations title. In 2001, Ireland defeated England 20000–14 in a postponed match at Lansdowne Road to deny them a Grand Slam. Although the 2002 Six Nations Championship title was won by France, England had the consolation of winning the wooden spoon. In 2002, England defeated Argentina in Buenos Aires, New Zealand, Australia, and South Africa at Twickenham. In 2003, England won the Grand Slam for the first time since 1995, followed by wins over Australia and the All Blacks on their Summer tour in June. Going into the 2003 World Cup, England were one of the tournament favourites. They reached the final on 22 November 2003 against host Australia and became world champions after a match-winning drop goal by star flyhalf Jonny Wilkinson deep into extra time that made the final score 20–17. Not only was it their first Rugby World Cup victory, but it was the country's first World Cup since winning the 1966 FIFA (football) World Cup as hosts. 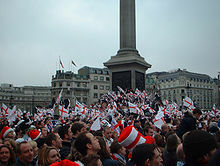 On 8 December, the English team greeted 750,000 supporters on their victory parade through London before meeting Queen Elizabeth II at Buckingham Palace. In the 2007 World Cup England played in Pool A with Samoa, Tonga, South Africa and the United States. They qualified for the quarter finals after losing embarrassingly to South Africa 36–0 where they defeated Australia 12–10, and then faced hosts France in their semi-final. England won 14–9 to qualify for the final against South Africa, which they lost 15–6. England followed up the World Cup with two consecutive 2nd place finishes in the Six Nations, behind Wales and Ireland respectively. The 2009 Six Nations also saw former England Captain Martin Johnson take up the job of head coach. However, Johnson could not replicate his on-field success to management, and resigned in November 2011 following a miserable 2011 Rugby World Cup which ended in quarter-final defeat by France and featured a series of on and off-field controversies. During the 2013 summer tour to South America in which Lancaster took an experimental side, England beat a South American select XV before a 2–0 series victory over Argentina, a first away series win against The Pumas for 32 years. England hosted the 2015 Rugby World Cup but were eliminated in the Pool stage, the first hosts in a Rugby World Cup to have failed to qualify for the knockout stages. However, despite the 2015 World Cup setback following the appointment of new head coach Eddie Jones, England won the Grand Slam in the 2016 Six Nations Championship, went the whole of 2016 unbeaten, including winning a series whitewash over Australia in Sydney, and equalled the world record of 18 consecutive test wins with an impressive 61–21 victory over Scotland securing the six nations championship of the 2017 edition. In 2018, England lost five consecutive test matches, including a home match versus Ireland. Although England have played home matches almost exclusively at Twickenham since 1910, they have played at Huddersfield's Galpharm Stadium twice in 1998, at Old Trafford against New Zealand in 1997 and at Wembley Stadium against Canada in 1992. They also played the first of a two-test series against Argentina at Old Trafford in June 2009, a match originally scheduled to be held in Argentina but moved by the country's national federation for financial reasons. "Swing Low, Sweet Chariot" is very commonly sung at England fixtures – especially at Twickenham. The song arrived in the rugby canon through the Welsh male voice choirs who sang many spirituals. It was a popular rugby song at clubs during the 1950s and 1960s and was sung every year at Twickenham during the end-of-season all-day Middlesex Sevens tournament accompanied by risqué hand gestures that played on the double entendres of some of the words. During the 1970s the Twickenham crowd also sang it during England matches then coming into the last match of the 1988 season, against the Irish, England had lost 15 of their previous 23 matches in the Five Nations Championship. The Twickenham crowd had only seen one solitary England try in the previous two years and at half time against Ireland they were 3–0 down. During the second half a remarkable transformation took place and England started playing an expansive game many had doubted they were capable of producing. A 3–0 deficit was turned into a 35–3 win, with England scoring six tries. In the 35–3 win, three of England's tries were scored by Chris Oti, a player who had made a reputation for himself that season as a speedster on the left wing. A group of boys from the Benedictine school Douai following a tradition at their school games sang the song on his final try, and other spectators around the ground joined in. Since then "Swing Low, Sweet Chariot" became a song to sing at England home games, in the same way that "The Fields of Athenry" is sung in Dublin and "Cwm Rhondda" is sung at Cardiff. It has since become the anthem of the team as in 1991 the result of a plan of the then RFU marketing director Mike Coley for the team to launch a song leading up to that year's Rugby World Cup. He had wanted to use Jerusalem but it was used in the Rugby League cup final that year so the song was changed at short notice to "Swing Low". There were a number of versions recorded but the version released did reach the top 40 in the UK singles chart during the competition and was then adopted as the England rugby song. England have typically worn all-white jerseys, white shorts with and predominantly black socks. The emblem on the shirts is a red rose, rather than the Plantagenet Three Lions displayed on the shirts of the England football and cricket teams. The strip is manufactured by Canterbury and O2 is the shirt sponsor. The change strip is typically dark grey (described as anthracite), although prior to the introduction of the grey strip, red was traditionally worn. Navy blue was used in the past and was reintroduced for the 2016-17 season. Purple was used as the change strip as of the 2009 autumn internationals, reflecting the traditional colour of the original England track-suits from the 1960s, 70s and 80s. For the 2011 Rugby World Cup the change kit was black for the first time. The former England home strip was white with a strip of red around the neck, and the away strip was black (causing much controversy due to the famous All-Black kit of New Zealand), both kits had a ground breaking new technology in the form of a gripper print. A special strip was worn during the match versus Wales in the 2010 Six Nations Championship which replicated that worn in 1910 to celebrate the 100-year anniversary of Twickenham. The current, 2018-19, England strip is made by Canterbury. It features plain white shorts and a plain white shirt with red seams at the top. The design also features a variety of embossed St. George's Cross patterns incorporating red, titanium and platinum colours throughout. The crest is 3D injection moulded, and the neckline is a newly redesigned. The current alternative kit is dark grey and features the same embossed St. George's Crosses. Shorts are also dark Grey. Both socks are dark grey with a white top. In 2013-14, the strip featured plain white shorts and a plain white shirt, but with an added black stripe on each sleeve. The alternative kit had a red and white striped shirt, with blue shorts.In 2014/15, the home shirt was white, with a "V-Neck" around the collar. The kit also had little Victoria Crosses on the main chest. It also had the O2 sponsorship marking on the chest. The shorts were plain white with the sponsorship marking on them. The socks were dark blue and had a white stripe at the top. The alternate shirt was exactly the same but was red instead of white. The shorts were navy blue and the socks were red with a white stripe on top. The 2015/16 strip was similar but didn't have the small crosses on the shirt. The Canterbury logo was straight and not diagonal it had white lines going horizontally across the chest. For the 2015 Rugby World Cup, the kit remained the same just with the Rugby World Cup logo on the right and no O2 logo in the centre. For the home strip, the shorts and socks remained the same. The away 2015/16 strip and World Cup strip was red, with dark red and maroon sleeves. The shorts were maroon and the socks were red with a maroon stripe on top. England competes annually in the Six Nations Championship, which is played against five other European nations: France, Ireland, Italy, Scotland, and Wales. The Six Nations started out as the Home Nations Championship in 1883 which England won with a Triple Crown. England have won the title outright 28 times (a record for the tournament) and shared victory ten times. Their longest wait between championships was 18 years (1892–1910). During the Six Nations, England also contests the Calcutta Cup with Scotland (which England first won in 1880) and the Millennium Trophy with Ireland (which England first won in 1988). The matches between England and France are traditionally known as "Le Crunch". In the 2003 tournament, England came top of their pool. They progressed to the final beating Wales and France in the quarter and semi-finals. England won the final with a drop goal in the last minute of extra time. In 2011, England reached the quarter final stage, losing 19–12 to France. In 2015, England became the first sole host nation to fail to qualify for the knockout stage, exiting the pool stage after losses to Wales and Australia. When the World Rugby Rankings were introduced in October 2003, England was ranked 1st. They briefly fell to 2nd in September that year before regaining 1st place. They fell to 2nd, and then to 3rd in June 2004. After the 2005 Six Nations they fell to 6th where they remained until they moved into 5th in December that year. In 2006, their ranking again fell and they finished the year ranked 7th. 2007 saw them bounce back to 3rd after their good run in that year's World Cup, where they finished runners-up. In 2008, their rankings slipped so that during the 2009 Six Nations Championship they dropped to their lowest ranking of 8th. They again were 8th during the autumn internationals of the same year. After a resurgence which saw them rise to a ranking of 4th in the world, the team again slipped, following a poor showing at the 2011 Rugby World Cup, and was ranked 6th in February 2012. England entered the 2015 Rugby World Cup ranked 4th. However, after failing to exit the pool stage, England were ranked 8th in the world as of 1 November 2015. England have won 403 of their 732 Test matches; a winning record of 55%. Below is a summary table of capped England matches up until 16 March 2019. Only fixtures recognised as test matches by the RFU are included. On 17 January, England named a 35-man squad ahead of the 2019 Six Nations Championship. On 5 February, Nick Isiekwe replaced Maro Itoje in the squad. Between September 2015 and March 2017 England won a top tier nation record equalling 18 test matches in a row, 17 of which were under Eddie Jones. England's mid-year tests and end of year tests are televised live by Sky Sports. Highlights of the end of year tests are broadcast by the BBC. All Six Nations games are broadcast free-to-air on the BBC and ITV since 2016. Bowker, Barry (1978). England Rugby. Cassell. ISBN 978-0-304-30214-7. Farmer, Stuart (2006). The Official England Rugby Miscellany. Vision Sports Publishing Limited. ISBN 978-1-905326-12-9. Morgan, Michael (2002). "Optimizing the structure of elite competitions in professional sport – lessons from Rugby Union". Managing Leisure. 7: 41–60. doi:10.1080/13606710110117023. Tuck, Jason (2003). "The Men in White: Reflections on Rugby Union, the Media and Englishness". International Review for the Sociology of Sport. 38 (2): 177–199. doi:10.1177/1012690203038002003. ^ "Origins of Rugby". rugbyfootballhistory.com. Retrieved 16 February 2007. ^ a b "World Rugby 1871–1888". rfu.com. Archived from the original on 3 June 2013. Retrieved 16 February 2012. ^ "Historical Rugby Milestones – 1870s". rugbyfootballhistory.com. Retrieved 16 February 2007. ^ "England vs Scotland > Games Played". rugbydata.com. Retrieved 16 February 2006. ^ "5 February 1872 – The Oval, London, England". rugbydata.com. Retrieved 16 February 2007. ^ "Statistics explanation". Scrum.com. 1 October 2008. Retrieved 7 August 2011. ^ "15 February 1875 – The Oval, London, England". rugbydata.com. Retrieved 16 February 2007. ^ "Ireland > Games Played". rugbydata.com. Retrieved 16 February 2007. ^ "28 February 1880 Whalley Range, Manchester, England". rugbydata.com. Retrieved 19 February 2007. ^ a b "Historical Rugby Milestones – 1880s". rugbyfootballhistory.com. Retrieved 19 February 2007. ^ a b "19 February 1881 Richardsons Field, Blackheath, England". rugbydata.com. Retrieved 19 February 2007. ^ "16 December 1882 St Helens, Swansea, Wales". rugbydata.com. Retrieved 19 February 2007. ^ "Six Nations roll of honour". BBC. 19 January 2004. Retrieved 19 February 2007. ^ "Unsporting behaviour? – the New Zealand Natives' rugby tour of 1888/89". nzhistory.net.nz. Retrieved 16 February 2007. ^ "Matches played – New Zealand Natives' rugby tour of 1888/89". nzhistory.net.nz. Retrieved 16 February 2007. ^ "6 Nations History". rugbyfootballhistory.com. Retrieved 2 September 2007. ^ "6th All Black Test : 79th All Black Game". allblacks.com. Retrieved 6 September 2007. ^ Gallagher, Brendan (4 July 2007). "50 imperfect sporting moments". London: The Telegraph. Retrieved 4 July 2007. ^ "Historical Rugby Milestones 1900s". rugbyfootballhistory.com. Retrieved 1 August 2007. ^ a b c "6 Nations History". rugbyfootballhistory.com. Retrieved 1 August 2007. ^ "30th All Black Test : 199th All Black Game". allblacks.com. Retrieved 1 August 2007. ^ "Six Nations history". BBC. 28 January 2002. Retrieved 1 August 2007. ^ A Triple Crown is when a Home Nation defeats the other three in one tournament. ^ "52nd All Black Test: 311th All Black Game". allblacks.com. Retrieved 19 February 2007. ^ Polanski (2003), pg 38–39. ^ "International Teams > England > Games Played". rugbydata.com. Retrieved 2 August 2007. ^ a b Stephens, Paul (7 June 2007). "Don White". The Guardian. UK. Retrieved 4 July 2007. ^ Ackford, Paul (12 November 2006). "Breaking the losing streak". The Daily Telegraph. UK. Retrieved 2 August 2007. ^ "1980 Grand Slam by James Owen". directart.co.uk. Retrieved 2 August 2007. ^ Mather, Adrian (6 February 2007). "Vandal-hit youth club gets a fresh start in new premises". edinburghnews.scotsman.com. Archived from the original on 12 October 2007. Retrieved 2 August 2007. ^ "1987 Rugby World Cup Results". worldcupweb.com. Archived from the original on 28 September 2007. Retrieved 2 August 2007. ^ "1991 Rugby World Cup Results". worldcupweb.com. Archived from the original on 28 September 2007. Retrieved 2 August 2007. ^ "289th All Black Test : 992nd All Black Game". allblacks.com. Retrieved 6 September 2007. ^ "1995 Rugby World Cup Results". worldcupweb.com. Archived from the original on 16 July 2007. Retrieved 2 August 2007. ^ Hodgetts, Rob (30 June 2007). "How do England bounce back?". BBC. Retrieved 2 August 2007. ^ "Brave Scots defeat England". BBC. 2 April 2000. Retrieved 17 March 2007. ^ Wilcox, Greg (27 January 2002). "The longest six nations ... with a sting in the tail". The Guardian. UK. Retrieved 17 March 2007. ^ Aylwin, Michael (24 March 2002). "Clive is reluctantly happy". The Guardian. UK. Retrieved 17 March 2007. ^ Peter Berlin (11 November 2002). "RUGBY UNION : England makes history as All Blacks plot future - New York Times". Nytimes.com. Retrieved 2 February 2014. ^ "Argentina beaten by England youngsters". BBC. 22 May 2002. Retrieved 17 March 2007. ^ berlin, peter (11 November 2002). "England make history as All Blacks plot future". International Herald Tribune. Retrieved 17 March 2007. ^ Majendie, Matt (16 November 2002). "England stun Aussies". BBC. Retrieved 18 March 2007. ^ Standley, James (23 November 2002). "England rout sorry Springboks". BBC. Retrieved 18 March 2007. ^ Paul, Gregor (26 August 2007). "RWC 2003: The All Blacks peak too early". The New Zealand Herald. Retrieved 2 September 2007. ^ Anthony, Andrew (9 December 2003). "England 750,000, Australia nil". The Guardian. UK. Retrieved 2 September 2007. ^ Moore, Jonathon (27 March 2004). "Six Nations: End of term report". BBC. Retrieved 21 February 2007. ^ "Woodward quits England". BBC. 3 September 2004. Retrieved 21 February 2007. ^ Palmer, Bryn (21 March 2005). "Wonderful Wales exude joy of Six". BBC. Retrieved 21 February 2007. ^ "England 26–16 Australia". BBC. 12 November 2005. Retrieved 21 February 2007. ^ Ackford, Paul (19 November 2005). "England's onslaught ends in gallant failure". The Daily Telegraph. UK. Retrieved 21 February 2007. ^ Standley, James (25 November 2006). "England 14–25 South Africa". BBC. Retrieved 22 February 2007. ^ "Ashton confirmed as new England rugby head coach". The Taipei Times. Taiwan (ROC). 21 December 2006. Retrieved 22 February 2007. ^ Harlow, Phil (3 February 2007). "England 42–20 Scotland". BBC. Retrieved 22 February 2007. ^ "England suffer record defeat". The Daily Telegraph. UK. 24 February 2007. Retrieved 6 September 2007. ^ Robert Kitson (2012-03-29). "Lancaster appointed England Coach". The Guardian. Theguardian.com. Retrieved 2 February 2014. ^ New Zealand (3 December 2012). "England beat the All Blacks". London: Telegraph.co.uk. Retrieved 2 February 2014. ^ "England defeat Argentina". Bbc.co.uk. 16 June 2013. Retrieved 2 February 2014. ^ Fordyce, Tom (4 October 2015). "England's Rugby World Cup: Where did it all go wrong?". BBC Sport. Retrieved 10 October 2015. ^ a b "Twickenham Stadium Time Line". rfu.com. Archived from the original on 15 January 2012. Retrieved 16 February 2012. ^ "The Rugby ground". twickenham-museum.org.uk. Retrieved 31 July 2007. ^ Price, Sally (29 October 2006). "England v New Zealand Celebration Match Twickenham". rugbynetwork.net. Retrieved 31 July 2007. ^ Cleary, Mick (7 November 2006). "Ruthless All Blacks make England pay". The Daily Telegraph. UK. Retrieved 31 July 2007. ^ "Eeh-bah-scrum, Woody;Rugby Union". The Sun. 9 December 1997. p. 29. ^ Jones, Stephen (22 November 1998). "England not good enough". The Sunday Times. UK. ^ "England to play at Old Trafford". BBC Sport. 3 February 2009. Retrieved 17 January 2010. ^ Mairs, Gavin (12 June 2012). "Editor". Telegraph. London. ^ "Swing Low Sweet Chariot as an England Rugby Anthem". everyhit.com. Retrieved 28 October 2009. ^ "The Rugby Store". rfu.com. Archived from the original on 14 March 2012. Retrieved 16 February 2012. ^ a b c d the Museum of Rugby, Twickenham (3 June 2005). "England's Rose – The Official History". Unofficial England Rugby Union. Retrieved 15 February 2007. ^ "England trial World Cup kit". BBC. 29 August 2003. Retrieved 6 September 2007. ^ "Seeing red over England's new World Cup shirt". The Daily Mail. UK. 13 May 2007. Retrieved 4 July 2007. ^ "New England Nike Rugby Kit Launched". rfu.com. 15 May 2007. Archived from the original on 3 June 2013. Retrieved 16 February 2012. ^ a b "International Rugby Union Statistics ��� England". ESPN Scrum. Archived from the original on 6 October 2014. Retrieved 29 September 2007. ^ Gallagher, Brendan (17 November 2005). "Joining the legends an added bonus for Wood". The Daily Telegraph. UK. Retrieved 6 September 2007. ^ "Sixth Induction Dinner – 2007". International Rugby Hall of Fame. Archived from the original on 29 June 2012. Retrieved 3 October 2007. ^ a b c d "RWC legends inducted into IRB Hall of Fame" (Press release). International Rugby Board. 26 October 2011. Archived from the original on 27 October 2011. Retrieved 26 October 2011. ^ a b "Hancock and Cardiff inducted to Hall of Fame" (Press release). International Rugby Board. 6 May 2011. Archived from the original on 9 May 2011. Retrieved 7 May 2011. ^ a b "Legends inducted into IRB Hall of Fame" (Press release). International Rugby Board. 18 November 2013. Archived from the original on 3 December 2013. Retrieved 1 December 2013. ^ a b "Hamersley inducted into IRB Hall of Fame" (Press release). International Rugby Board. 10 January 2013. Archived from the original on 23 January 2013. Retrieved 24 February 2013. ^ "Wavell Wakefield". rugbyhalloffame.com. Archived from the original on 14 September 2012. Retrieved 14 July 2007. ^ "Bill Beaumont". rugbyhalloffame.com. Archived from the original on 8 September 2012. Retrieved 14 July 2007. ^ a b "Martin Johnson". rugbyhalloffame.com. Archived from the original on 9 September 2012. Retrieved 14 July 2007. ^ "Lion Legends: Martin Johnson". British and Irish Lions. Archived from the original on 25 October 2007. Retrieved 15 February 2008. ^ "Martin Johnson – England's greatest-ever captain". sportasylum.com. Archived from the original on 2 December 2012. Retrieved 14 July 2007. ^ "England's Jason Leonard OBE – Dossier". rugbynetwork.net. 13 April 2004. Retrieved 24 October 2007. ^ a b "Jason Leonard". rugbyhalloffame.com. Archived from the original on 11 September 2012. Retrieved 24 October 2007. ^ "Player Records (ordered by matches)". ESPN. Archived from the original on 22 August 2018. ^ "Player Records (ordered by points)". ESPN. Archived from the original on 25 July 2015. ^ "Player Records (ordered by tries)". ESPN. Archived from the original on 18 March 2012. ^ "England choose Pennyhill Park" (PDF). Pennyhill Park Hotel's website. Archived from the original (PDF) on 5 October 2011. Retrieved 7 January 2010. ^ "Two of the three England teams to train at Surrey Sports Park managed emphatic victories over Wales in the RBS 6 Nations". Surrey Sports Park's Website. Archived from the original on 1 August 2013. Retrieved 9 March 2012. ^ Tuck (2003), pg 195. ^ Hewett, Chris (3 March 1998). "Woodward embroiled in club v country spat rears its face again". The Independent. UK. p. 27. ^ Baldwin, Mark (2 November 2002). "Tour from Hell that left some players burnt". The Times. UK. p. 40. ^ Morgan (2002), pg 56. ^ "New deal to protect England stars". BBC. 24 July 2001. Retrieved 31 August 2007. ^ Hewett, Chris (4 September 2004). "I wasn't ready to compromise. I wanted more and I got less...". The Independent. UK. p. 76. ^ Walsh, David (5 August 2007). "The Big Interview: Andy Robinson". The Times. UK. Retrieved 31 August 2007. ^ "Ashton set to name side for Croker". rte.ie. 14 June 2007. Retrieved 31 August 2007. ^ Cain, Nick (24 June 2007). "Peace deal agreed in club v country row". The Times. UK. Retrieved 31 August 2007. ^ "Eddie Jones appointed England Head Coach". RFU. 20 November 2015. Retrieved 20 November 2015. ^ "Woodward quits England". BBC. 3 September 2004. Retrieved 4 July 2007. ^ "Robinson named new England coach". BBC. 15 October 2004. Retrieved 4 July 2007. ^ "Press Statement from Andy Robinson OBE". rfu.com. 29 November 2006. Archived from the original on 3 June 2013. Retrieved 4 July 2007. ^ "England appoint Ashton to the top job". BBC. 20 December 2006. Retrieved 4 July 2007. ^ As Martin Johnson was absent from the 2008 mid-year Tests in New Zealand, Rob Andrew coached the team. ^ a b "Johnson named as England supremo". BBC. 16 April 2008. Retrieved 18 April 2008.